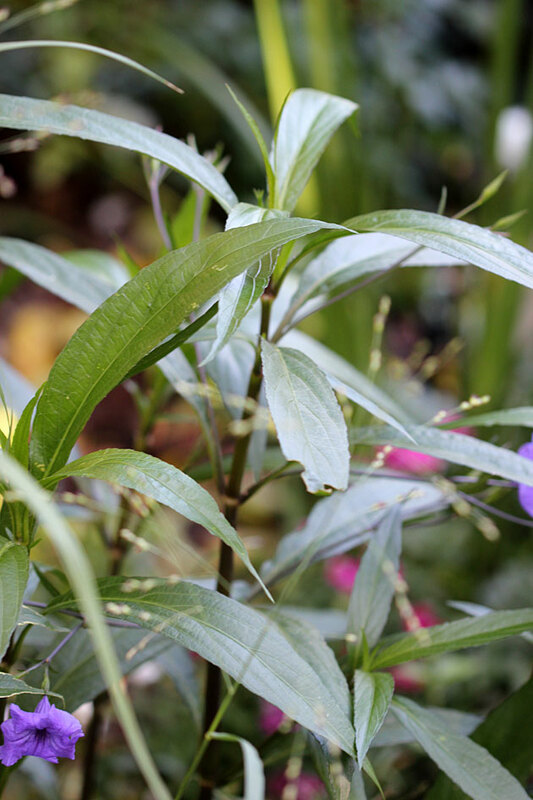 The Mexican Petunia is a beautiful plant in its own right and looks really stunning … but look how extra-stunning it looks with the dainty flower heads of the Panicum virgatum just peeping through. And it does that without detracting from the beauty of the plant – I love these two together. 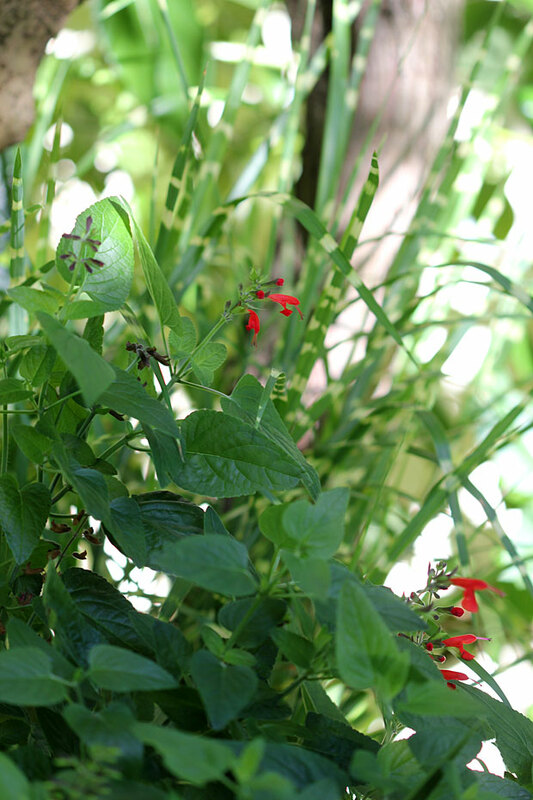 Miscanthus sinesis “Zebrinus” and Salvia Coccinea are both plants worth having in your garden. But look how stunning they are together! Another reason I love grasses – gorgeous alone but whatever you put them with just seems to “pop” right out of the bed, straight at you! The Weigela is sadly not doing much this year because I believe I pruned it at the wrong time. But look how simply gorgeous the few blooms and all the foliage look against the soft flower heads of the Panicum virgatum. Just lovely. If you don’t already have, just get some! Find your favourite grass and then start with just a few. You will find they brighten up the dullest areas, are gorgeous on their own, in combinations and en-masse and provide interesting colour almost all year round. It’s a no-brainer for me. 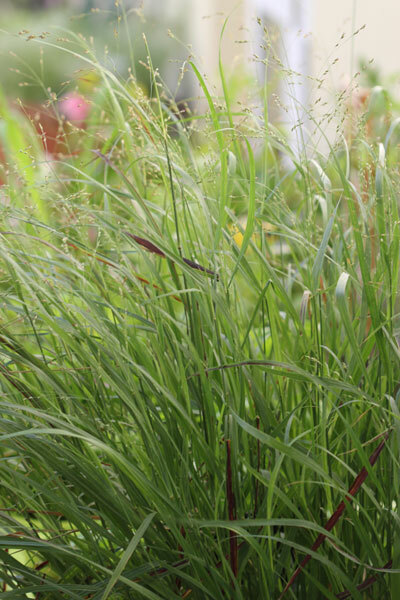 My favorite ornamental grass is — all of them! If I had to pick it would be Zebra Grass. Such a surprise to see the Mexican Petunia there, It’s a native here and grows wild in untended spots around town. The native one looks slightly different, but I enjoy the cultivated ones in my yard too. The Panicum virgatum is my favourite – the colour changes in the different seasons and the wispy seeds, like Alan points out – how gorgeous is that?? Nothing yet. I am trying to get rid off my grasses and plant more trees, flowering plants instead so that no more mowing . I was wrong about the 400 grasses in Texas….turns out there are 560 species of grasses in Texas!!! I’ve only just started putting ornamental grasses in my garden – they definitely add a wonderful dimension and texture to the area. I’m still uncertain as to where to put them and what plants would look best with them… it’s great to see your combinations! Hi Indie – I am in exactly the same stage as you are with grasses – I only started very recently and don’t have many yet. What I do is buy them, bring them home and move them around in their bags under I find a spot where they look good. Then I plant! And every time I am awed by the outcome a few weeks later. And they just get better as time goes on! You’ve almost convinced me. Keep working! I’ll let you know when I take the plunge! Hehe Holley, I’ll keep at it! Looking out at my winter gardens, I see many places where I want to add grasses–for height, texture, and sound. I pick a color in the leaf and try and match it with other perennials. And what’s nice about grasses is that you don’t have to worry about concurrent bloom times. I agree Mary. They are so versatile! I’m still nurturing my zebra grass. But I have seen some daunting pictures of full grown specimens. Will keep a beady eye on mine. 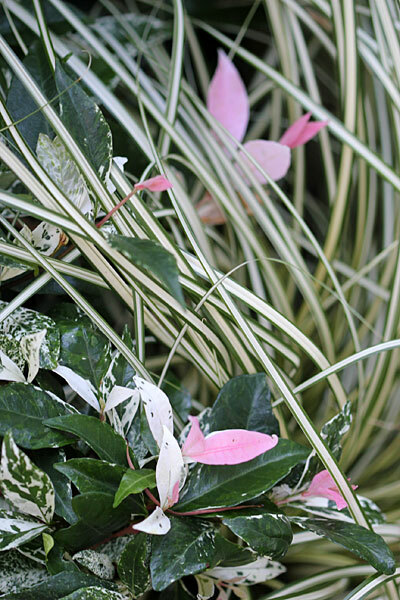 Another thing we have in common…no, I would NEVER get tired of talking about ornamental grasses. I love them all. I think we have over 400 species of grasses in Texas. 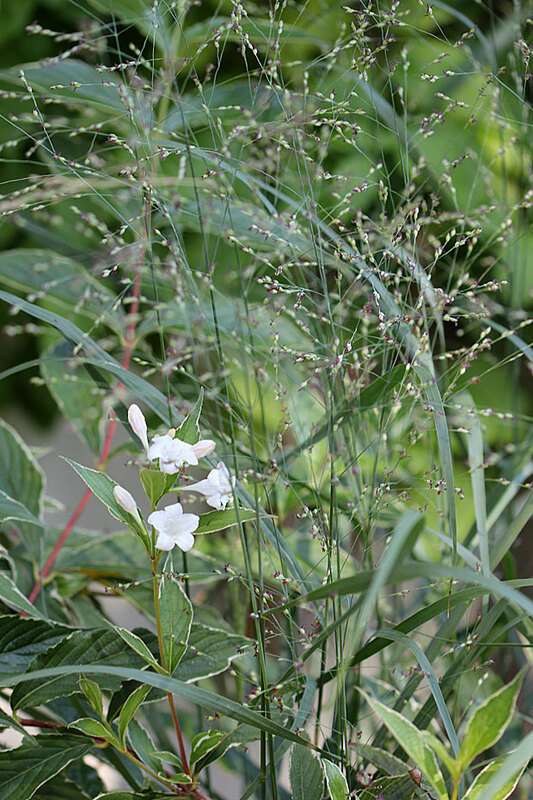 Panicum….one of my favorites genera. I loved your photo. Over 400 species of grasses in Texas – thats amazing! Must be such a pleasure to go shopping for grasses over there. I really battle to find what I want here. I do not have as many grasses in my garden as you, but after seeing how brilliantly you combine and contrast these in the garden…I may just have to add much more. This is a great illustration of the beauty and form function of grasses. I love the way the panicum virgatum seed heads have a little purple ruffle on them. If you haven’t noticed, look really closely. Beautiful! Christine, where were 20 years ago? 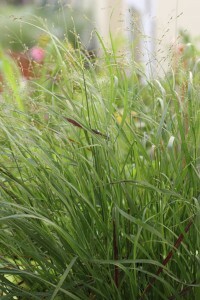 It took me a long time to discover the virtues of grasses in the garden. I went through the Japanese garden phase, the rose garden phase, the clip-everything-within-an-inch-of-its-life phase. 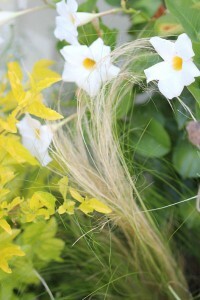 It wasn’t until about 7 years ago that I dabbled in ornamental grasses. I was so mad at myself! Mad for not trying them sooner. I was afraid they’d give the garden too relaxed a look (if anything, the garden looked much less uptight). 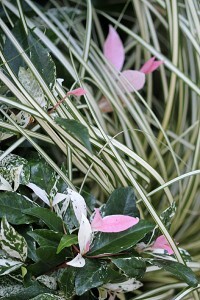 I love the contrast of their foliage, and their seed heads, and the added movement in the garden. I’m actually about to plant a rather large mass of native ornamental grasses in front of the house (I’m getting braver in my old age). I really love the purplish tips on your Panicum virgatum seeds, an unexpected splash of color! I’d say to any gardener on the fence about ornamental grass…get off, and take the plunge! Hi Clare – I’m so fortunate I discovered the ornamental grasses very early on in my gardening hobby, and it has been primarily from reading the blogs I do! I’ve been introduced to so many wonderful plants I would not have thought of myself, thanks to my gardening blog friends! I’m looking forward to seeing the large mass of native ornamental grasses you are planning to plant in front of your house!! When is that happening, I can’t wait to see.